Found in shallow waters on the Chesapeake Bay and its tidal rivers, including marshes. Spends time on freshwater ponds and lakes; frequently found in areas with lots of bay grasses. Large flocks can be seen floating just off the Bay’s shoreline in winter. Visits the Bay region from autumn through spring, then spends the summer in the Prairie Pothole region of North and South Dakota and southern Canada. The ruddy duck has a large head with a wide gray bill and a short, thick neck. Its long, stiff tail is often held straight up in the air. Its legs are set far back on its body. Males are dull brown in autumn, turning grayish-brown like females in winter. In summer, when ruddy ducks are not found in the Chesapeake Bay region, males have a chestnut body and a blue bill. 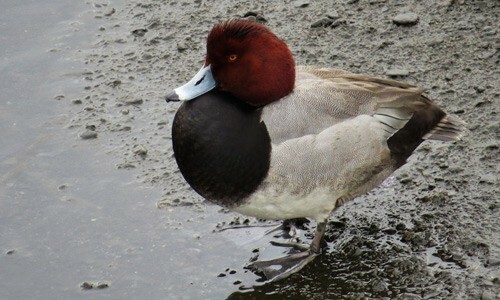 Males have white cheeks and a black “cap” on their head, while females have a dark, smudge-like line across their cheek. The ruddy duck grows to 16 inches with a wingspan of 23 inches. Ruddy ducks feed on bay grasses such as pondweeds and wild celery, but will also eat insects, mollusks and crustaceans in vegetated areas. They dive to find prey. Adults may be preyed upon by minks, hawks, owls and red foxes. Humans also hunt ruddy ducks. Ruddy ducks take off by running and pattering across the water’s surface. Their wings beat very rapidly while flying. 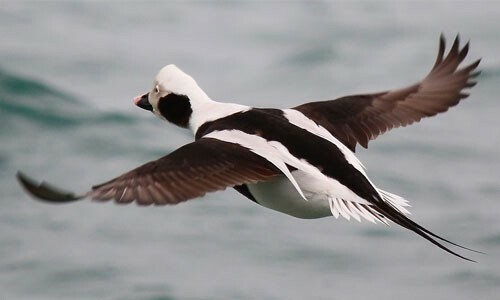 They can be identified in flight by their dark wings, white cheeks (on males) and stiff tail. Usually silent in winter, courting males produce ticking and clapping sounds by pressing its bill against its breast. The ruddy duck does not breed in the Chesapeake Bay region. Breeding occurs in spring and summer in the Prairie Pothole region of the Midwest and southern Canada. To attract a mate, males go through an extravagant courtship ritual that includes swimming around a female, slapping his chest with his bill, making several calls, and running across the water’s surface. Ruddy ducks can live as long as 13 years, but rarely live longer than 2 to 3 years. Ruddy ducks are one of the smallest ducks found in the Chesapeake Bay region. 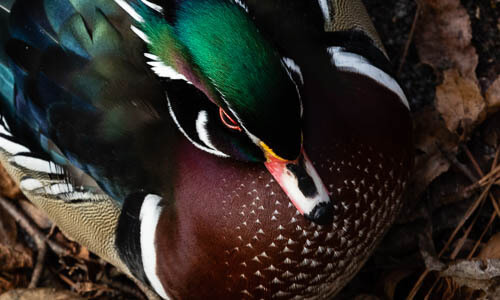 Even though they are small, they lay some of the largest eggs of any duck in the world. When alarmed, ruddy ducks dive underwater rather than flying away. Ruddy ducks are excellent swimmers. They use their long, stiff tail as a rudder to move underwater. However, they are extremely clumsy on land.